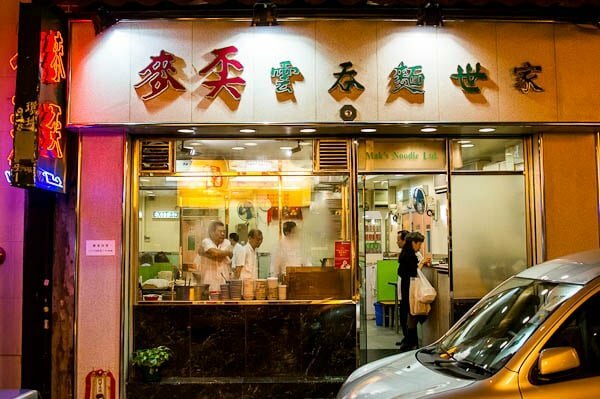 Mak’s is the Hong Kong institution, Tsim Chai Kee is the relative newcomer across the street who’s wonton noodles are the best? When I mentioned on Twitter that I’d be heading to Hong Kong for a few days, the food recommendations came pouring in. Everyone had a favorite, but the one place I consistently heard as a must-go spot was Mak’s Noodle for their Wonton Noodles. It’s a third generation Hong Kong institution and while the one on Wellington street is a reincarnation of the original, they’ve started sprouting branches all over Hong Kong. Since I was in Hong Kong to research some food stories, my first day was literally crammed with a gut-busting food crawl across Kowloon. My plan was to cram in as much food as I could during the day and keep dinner light with a bowl of Mak’s Noodles. Unfortunately a very long wait at The Peninsula had turned afternoon tea into evening tea and I decided to wander around the Kowloon waterfront before heading back back to Hong Kong island. This delay along with a few wrong turns meant I showed up at Mak’s around 8pm, right as they were lowering the shutters for the evening. Still not hungry, but unwilling to forgo a meal during my short visit, I wandered up and down Wellington Street checking out the food options. 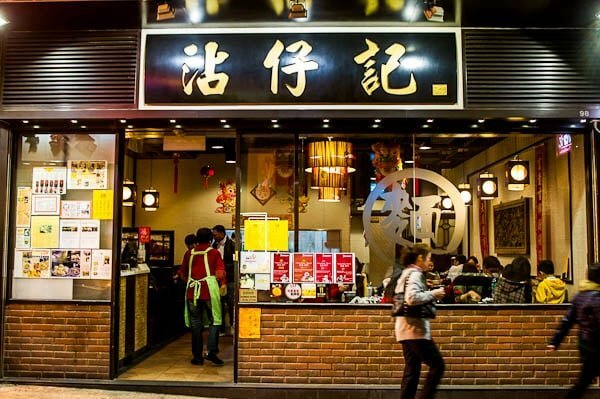 One of my guiding principals when looking for good food in a foreign country is to avoid places that are filled with foreigners. I also like to make like Toucan Sam and follow my nose because it always knows! That meant I walked right past the Middle Eastern joint filled with Europeans, and the handful of places that were empty and smelled like stale grease. 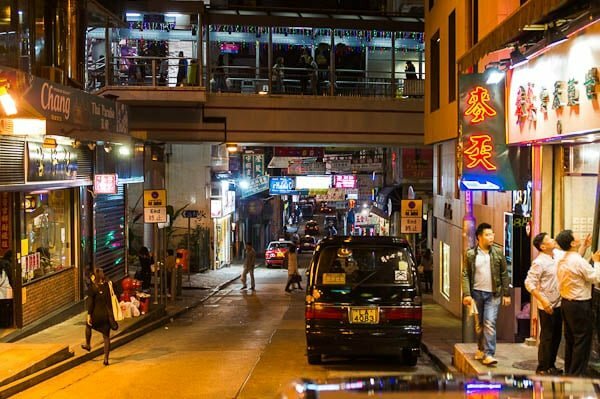 Tsim Chai Kee caught eye because it was brimming with locals packed into community tables like sardines. As I walked past the door, the sweet perfume of a good broth grabbed me by the nose and forced my legs to take a few steps back to keep myself from falling over. It also happens to be directly across the street from Mak’s Noodle. After a brief wait, I was squeezed in between a couple with a baby and a group of college-aged boys, all slurping noodles out of relatively small bowls. Perfect, considering how full I still was. The vibrant yellow noodles covered a bed of wontons with some scallions on top for garnish. When my noodles arrived, my disappointment at not being able to eat at Mak’s quickly dissipated as my first slurp sucked up a mouthful of the firmest noodles I’ve ever eaten with a perfectly balanced broth. The noodles were thinner than a Benetton model and yet they had more fortitude than Muhammad Ali. To call them crunchy would be odd, but they had a firm toothsome texture that made every bite a smile inducing experience. 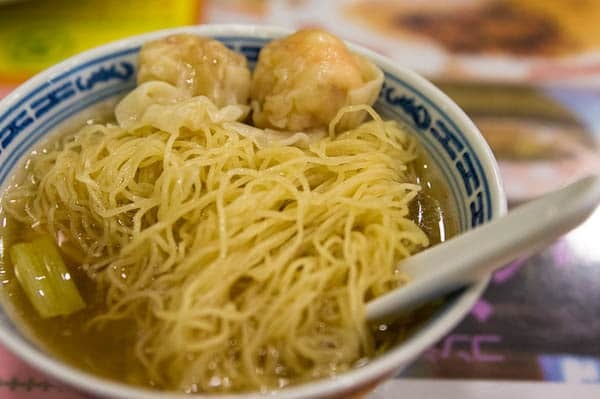 Under the noodles lay a generous bed of large wontons, each one containing a large shrimp that rivaled the noodles in firmness. The soup had a great balance of pork and seafood with just a hint of sweetness. Sip after sip, I couldn’t help but admire the balance and depth of flavor that can only develop when given enough time. Happy at the chance encounter and digestive tract about to blow a gasket, I rolled myself back to the hotel for the evening, promising myself I’d be back earlier the next night to try Mak’s Noodle. The next night as I walked towards Mak’s Noodle, I noticed that Tsim Chai Kee was once again buzzing with locals, with a line coming out the door at 7pm. Across the street, there was only one occupied table. Against my better judgement I walked in and sat down. Looking around, I saw a brightly colored dining room bathed in the hospital glow of aggressive fluorescent lighting, it screamed “old school noodle shop”, a good sign, I thought. What wasn’t a good sign was that the one table of customers was occupied by Japanese tourists. I also couldn’t help but notice the size of the bowls they were eating from, about the size of a large tea cup. I wondered if there was a child’s menu I wasn’t aware of. After asking about it, I was told they were deliberately small to prevent the noodles from going soggy. A brilliant idea in theory, but the minuscule bowl at Mak’s cost $1.70 USD more than Tsim Chai Kee for about half the quantity. Don’t get me wrong, I don’t mind paying a premium for premium food, but this disparity seemed dubious at best. I ended up ordering a bowl of wonton noodles and their pork chutney noodles which also came highly recommended. Had I not eaten across the street the night before I would have said the noodles at Mak’s were pleasantly al dente, but they were literally pale and limp in comparison. Mak’s wonton’s also contained a whole shrimp, but they were smaller and softer. While a bowl of wonton soup without MSG would be akin to Disneyland without Micky Mouse, its use in Mak’s soup was heavy handed. It literally covered up the flavors of the dried flounder, pork and shrimp in the broth with a cloying umami that lingers on your tongue long after you’ve finished eating. It wasn’t that the wonton noodles at Mak’s Noodle were bad, they just weren’t as good as the ones at Tsim Chai Kee. Thankfully, there is a bright spot at Mak’s. 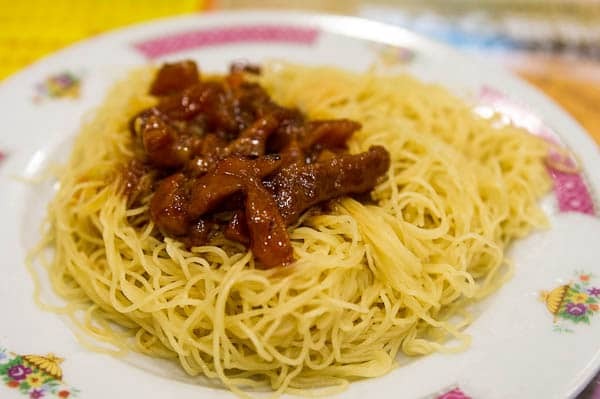 The pork chutney noodles were delicious. The meat was tough, almost like beef jerky, but it was a pleasant kind of tough that makes you work for the flavor, much like the firm noodles that lay underneath. The sweet and spicy sauce provided a nice balance to the fatty pork and firm noodles. 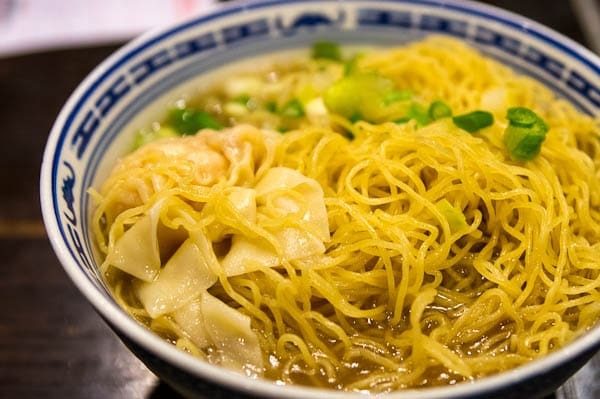 If you find yourself on Wellington street hungry, head to Mak’s for the pork chutney noodles, and then across the street for a bowl of Tsim Chai Kee’s wonton noodle soup. 77 Wellington Street, Central, Hong Kong. 98, Wellington St. Central, Hong Kong.